CHICAGO—In a city known for gangsters, bootleggers and corrupt politicians, residents will tell you the most reviled actor on the North Side is a tow-truck company. 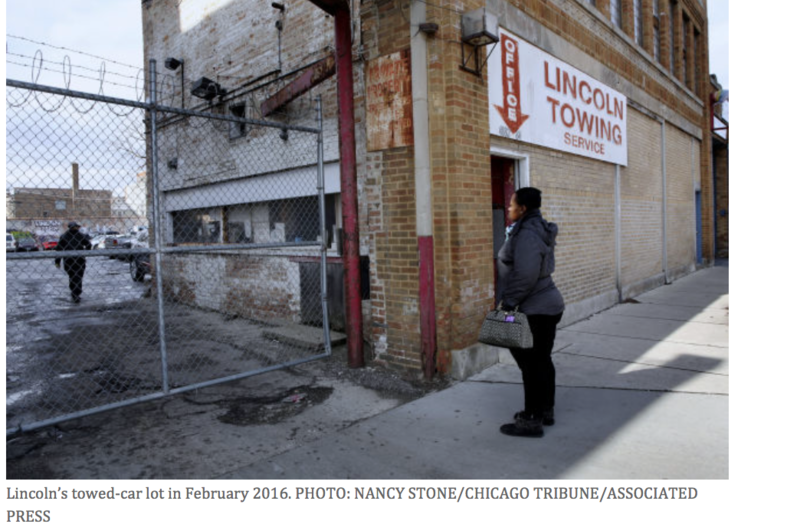 For more than half a century, Chicagoans have said Lincoln Towing Service—locally known as the Lincoln Park Pirates—has hauled away cars for no reason, overcharged motorists to get them back and taunted owners who complained. One woman spent two years in court pursing a complaint after she said Lincoln towed her car from her leased space one winter when she was pregnant, and accused her of being a drunk. A child-protection investigator said after Lincoln towed his car, employees at its lot laughed at him when he pointed out he had been on official business at a police station. 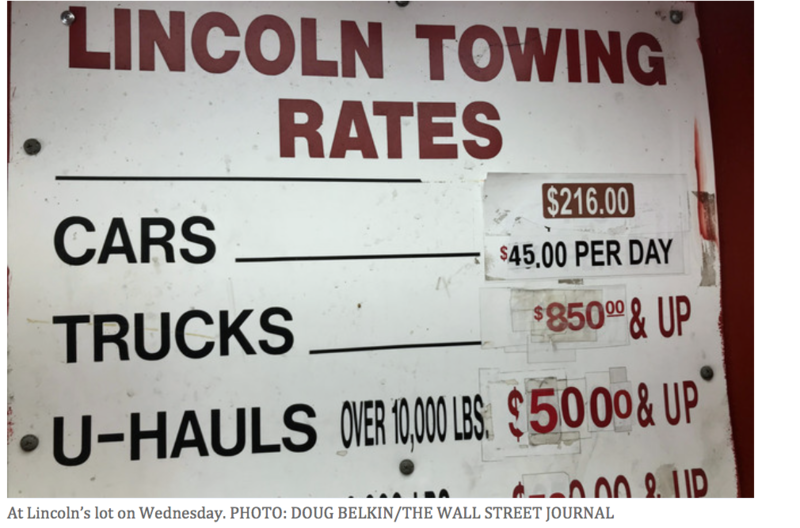 On Wednesday, a state commission revoked Lincoln’s commercial vehicle relocators license. Chicago cheered. Twitter bubbled with schadenfreude. A person reached by phone at Lincoln said the company had no comment. Employees at Lincoln’s yard directed inquiries to Allen Perl, the company’s lawyer, who didn’t respond to requests for comment. “Good for them!” said Patrick Armstrong, an investigator with the Illinois Department of Children and Family Services, speaking of the commerce commission after hearing it yanked Lincoln’s license. Mr. Armstrong said he parked his car across from a police station where he was discussing a child-abuse case in 2015, when Lincoln towed it despite his valid parking placard. He and a sergeant went to Lincoln’s office, he said, where an employee laughed at their complaint. He paid several hundred dollars to get his car back. Last year, Cheryl Reed was at a launch party for her new novel, she said, when Lincoln illegally hauled her car from a lot. When she called the company, the person hung up, she said. When she went to the lot tell them there was a mistake, she said, employees laughed at her. A journalism professor at Syracuse University, she challenged the $218 ticket and eventually got a refund. A commerce-commission report found that between July 2015 and March 2016, Lincoln towed 9,470 vehicles. Of those, more than 800 were unauthorized—cars towed by unlicensed drivers, for example, or relocated without a property owner’s consent or towed from lots where other companies had contracts. In 1972, Chicago folk singer Steve Goodman—he wrote “City of New Orleans” and, importantly, “Go Cubs Go”—wrote the song “Lincoln Park Pirates” about the tow service. The name stuck. ’Cause they’re all recent graduates of the charm school in Joliet [translation: Joliet Prison]. Mr. Goodman’s song on YouTube. Metal bars stand between owners and employees holding their vehicles. On Wednesday, a man behind those bars, identifying himself as a tow-truck driver there for 20 years, said the only bad attitudes came from people standing on the other side of the bars. “Why would we ever yell at anyone?” he said. 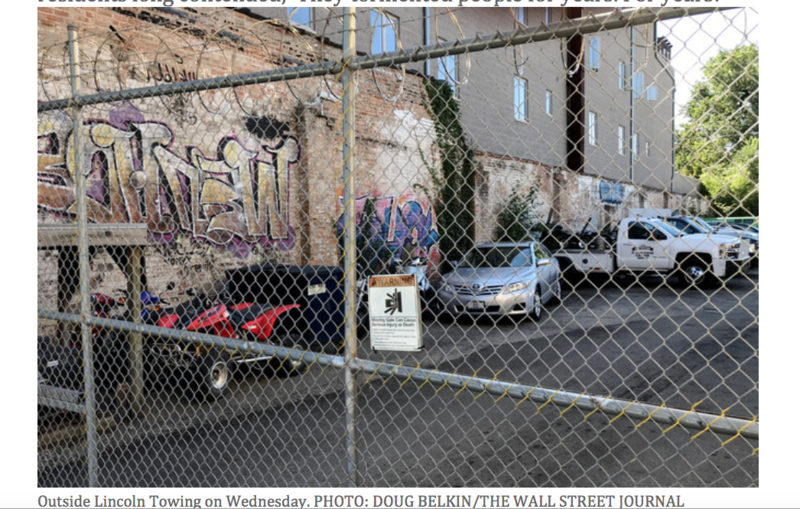 “If they don’t park where they’re not supposed to, they won’t get towed,” he said. Shortly after Ms. Amey’s experience, Lincoln towed a car whose owner was out of the country, said the owner’s son-in-law, Josh Thalheimer. The owner used Google Earth images to show it was usually parked in a legal spot and shouldn’t have been towed, he said. The family took the story to the media. Lincoln returned the car at no cost, he said, with a damaged mirror. “I thought, how many other people has this happened to?” said Basil Diab, a Chicago financial-services professional who, after reading of the case, started a petition in 2016 asking for an investigation of Lincoln. When Mr. Pawar heard the verdict, he said, he had one thought.